The decisive election of Hassan Rouhani as Iran’s new president has been greeted around the world as a sign that Iranians are tired of hardline policies at home and abroad and are ready to embrace change. But the outcome also raises the question of how the new president might go about it, given Iran’s powerful clerical leadership and long history of quashing reform efforts. Rouhani will inherit from his predecessor a host of difficult, even insurmountable problems. In the past eight years, such limited freedoms as existed have been severely eroded. The economy is in shambles due to Western-imposed sanctions and outgoing president Mahmoud Ahmadinejad’s reckless spending and misguided policies. With few real friends, Iran is internationally isolated, and its relations with the US and the Europeans are under strain over Iran’s nuclear program, its support for Assad in Syria, and its inflammatory rhetoric on Israel. Negotiations between Iran and the so-called 5+1 (five members of the UN Security Council and Germany) about Tehran’s nuclear program have been deadlocked. While he is considered a moderate, Rouhani comes to office as an insider. For sixteen years he was head of Iran’s National Security Council (NSC) and for two years Iran’s chief nuclear negotiator. Even today, he sits on the NSC as the personal representative of the supreme leader, Ayatollah Khamenei. He served five terms in the Majlis, or parliament. He sits on two major state councils, one of which, the Assembly of Experts, will elect Khamenei’s successor whenever he passes away. In holding high office, Rouhani was more a team player than a maverick and continues to support many existing Iranian policies. On Syria, since his election he has offered only the formulaic non-answer that the Syrian people should decide their own future through elections. Critics have noted that Rouhani spoke in support of the harsh crackdown on student protesters at Tehran University in 1999—he later explained he was in the government at the time and could have not done otherwise. He also was silent when security forces brutally crushed protests following the contested 2009 presidential elections, and his explanation for that silence remains unconvincing: he was not then in the government, he said, the nature of the protests had changed, and the protesters were obligated to act within the laws. Yet Rouhani did not run his campaign as an insider. On many issues, including political freedoms, the growing presence of government informants among student and civil society associations, Iran’s international relations and its nuclear negotiations with the West, and the state of the economy, he used language and adopted a posture at odds with those of the ruling conservatives and, indirectly, of the supreme leader. While regime conservatives paint a rosy picture of Iran’s international standing, Rouhani spoke during the campaign of the “clouded visage” of Iran in the world. Conservatives describe Iran as the freest country in the world, but Rouhani spoke of the “the bowed silhouette” of freedom in the country, and of the need to free political prisoners. Both the Abdorrahman Boroumand Foundation, an Iranian human rights group in Washington, DC, and the International Campaign for Human Rights in Iran estimate the number of political prisoners at any one time at around five hundred, although many hundreds more pass through the prison system for short periods of incarceration. Rouhani also promised to establish a ministry for women’s affairs, to pay attention to women’s rights, and to remove restrictions on women’s access to higher education imposed by the outgoing government. He also spoke vaguely of a “charter of rights” for all citizens. 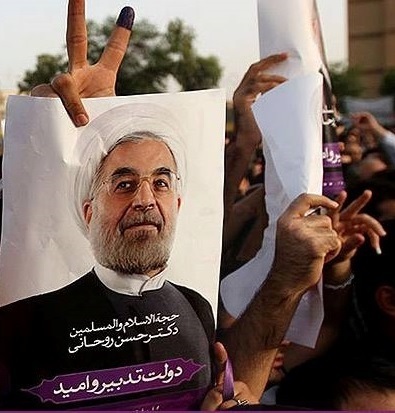 Regime hardliners have continued to attack their reformist counterparts as “seditionists,” while Rouhani, both during his campaign and in his first press conference after his victory, stressed the need for national reconciliation. He will be the president of all the Iranian people, he said. Rouhani also embraced and won the endorsement of two former presidents, Hashemi Rafsanjani and Mohammad Khatami. This was significant because both men are identified with the reformist endeavor and have been the target of vicious attacks by the hardliners. Rafsanjani, a pragmatist and ultimate insider (and president in 1989–1997), has been marginalized in recent years due to his centrist policies; and the Council of Guardians, which rules on the qualifications of candidates for the office of president, vetoed his candidacy on the lame excuse that, at age seventy-eight, he was too old to spend more than a few hours a day tending to the presidency. Khatami (president in 1997–2005) ushered in an unprecedented period of expanded freedoms, only to be frustrated by a right-wing backlash. On the nuclear issue, Rouhani has not strayed far from the official Iranian position—that Iran has a right to enrich nuclear fuel and to the full nuclear cycle, even though it has no intention of weaponizing—but his tone has been far more conciliatory. He has spoken proudly of his success, as Iran’s chief nuclear negotiator, negotiating compromise agreements with the Europeans in 2003 and 2005. Former British Foreign Secretary Jack Straw recalled that in the 2003 negotiations, Rouhani broke a deadlock by working the phones with Iran’s president and supreme leader, securing the flexibility to reach an agreement. In brief, he has a track record for looking for compromise and the middle ground, and he is offering greater transparency on Iran’s nuclear program. But the obstacles Rouhani faces are formidable. The internal security situation has grown worse in recent years. Journalists and intellectuals are routinely jailed for the mildest challenge to the ruling ideology. According to Amnesty International, Iran executed 314 individuals last year—one of the highest rates of execution in the world in relation to population size. Rouhani will win a lot of credit with the young and the urban middle class if he manages to remove the checkpoints, the security forces, and the morals police from the streets, close the secret detention centers, or if he secures freedom for political prisoners and the two opposition leaders, Mir Hossein Mousavi and Mehdi Karroubi, who have endured house arrest for the last four years. Yet any attempt by Rouhani to ease controls over the press, civic associations, and political activity will be opposed by Iran’s ubiquitous security agencies and by the powerful Revolutionary Guards. The economy is in dire straits. Mahmoud Ahmadinejad squandered a huge influx of oil revenues on pet populist projects and liberal handouts, without generating much employment or investment in productive industry. Under the impact of sanctions, the Iranian currency has lost more than half its value against the US dollar. Iranian oil exports have been halved. Iran’s once substantial foreign exchange reserves have shrunk. Iranian banks have been virtually squeezed out of international transactions, and Iranian industries are having difficulty securing spare parts and raw materials. Rouhani understands what needs to be done to reset the economy on a more sensible course, but he is caught on the horns of a dilemma. He cannot resolve Iran’s economic problems without a significant easing of banking and other Western-imposed sanctions. At the same time, the US insists on maintaining sanctions until Iran’s nuclear posture changes; and Rouhani may not be able to persuade Iran’s leader to be more flexible on the nuclear issue unless sanctions are eased. However, Rouhani’s election has aroused hopes and a sense of movement and possibilities—and pressure from the left to move quickly on multiple issues. Several senior clerics, congratulating Rouhani on his election, have urged him to address the problems of unemployment, inflation, moral decline, political division, and restrictions on political freedoms. Ayatollah Dastghaib, a senior cleric from Shiraz, called on Rouhani to expedite the release of Karroubi, Mousavi, and Mousavi’s wife, Zahra Rahnavard. There are other senior clerics, concerned at the mismanagement and the direction of the country under Ahmadinejad, who would support Rouhani’s efforts; but it is also the case that most of the senior clergy have been intimidated by the hardliners and have been relatively silent in recent years. Rouhani’s powers are limited: he cannot appoint judges or the chief of the judiciary; he cannot appoint the chiefs of the security forces. But one of his predecessors, Mohammad Khatami, succeeded in removing the intelligence minister—twice—reining in the ministry and purging it of its most notorious elements. Khatami also succeeded in lifting restrictions on the press, book publishing and political association. The security services are much stronger today, but Rouhani has a model he can emulate. And as president, he can at least provide a moral voice and speak out against the widespread violation of human rights. Clearly Rouhani’s task will not be easy. He will need time; he will need to pick his battles carefully; he will need to show progress without alienating the real centers of power in Iran; he will need support and understanding abroad. And he will need a great deal of luck. This article was originally published on The New York Review of Books blog.